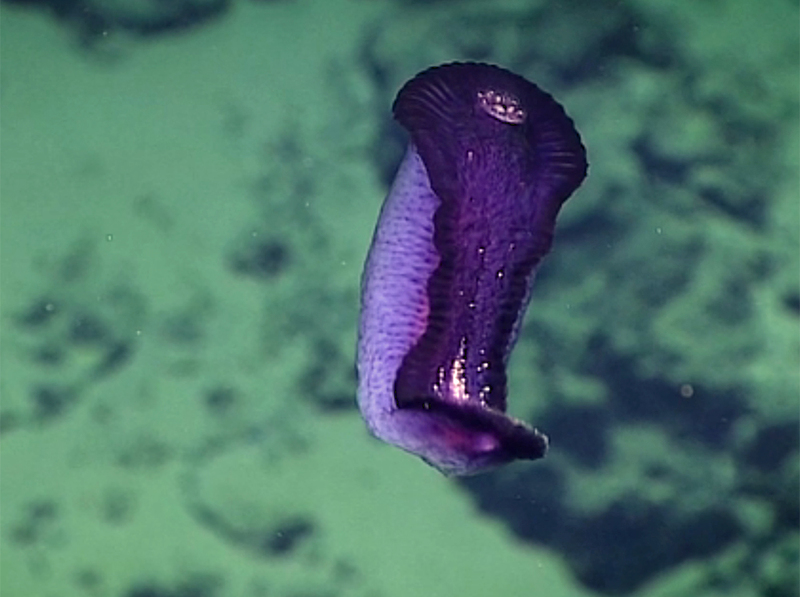 Here’s another interesting animal documented in the 2016 deep sea exploration in the Marianas Trench, an enteropneust or commonly known as the ‘acorn worm’. 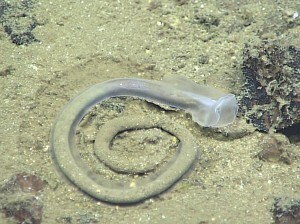 This worm leaves behind spiral deposits in the mud. The front end of these animals is shaped like an acorn, hence the name (who would have guessed, right?) and consists of a proboscis and collar that is likely uses to burrow. It ingests sediment and filters out nutrients much like an earthworm. This specimen was pictured at the bottom of the ocean in the Sirena Canyon. 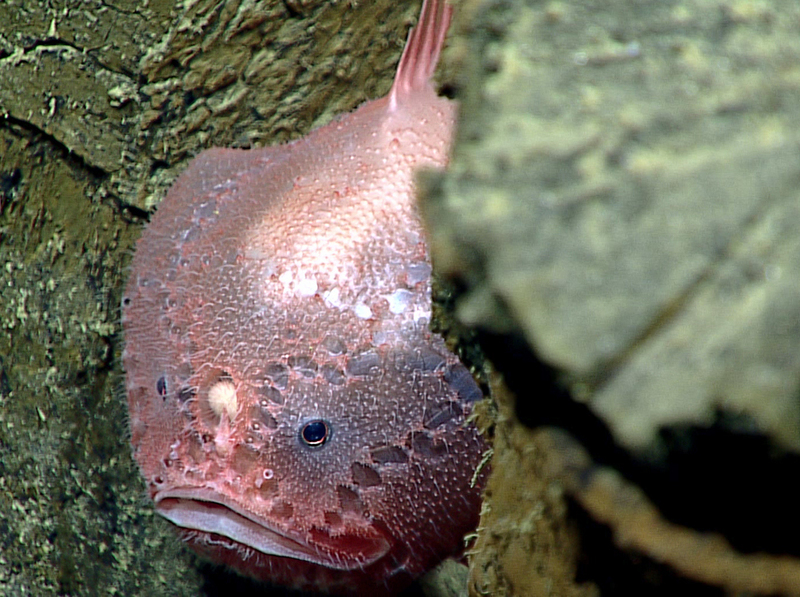 Turnicates spend their days attached to rocks feeding on small fish that swim into their hood-shaped mouths. 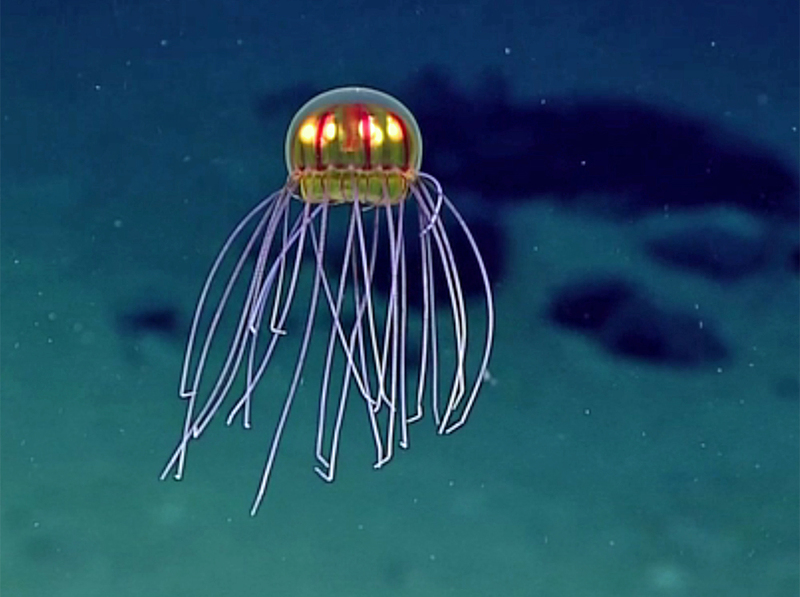 This fleshy jellyfish was seen during a dive at a depth of over 12,000 feet. 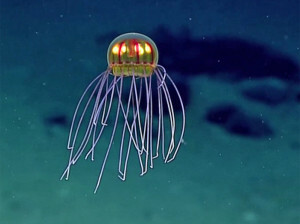 The red lines appear to be radial canals connecting the bright yellow gonads. 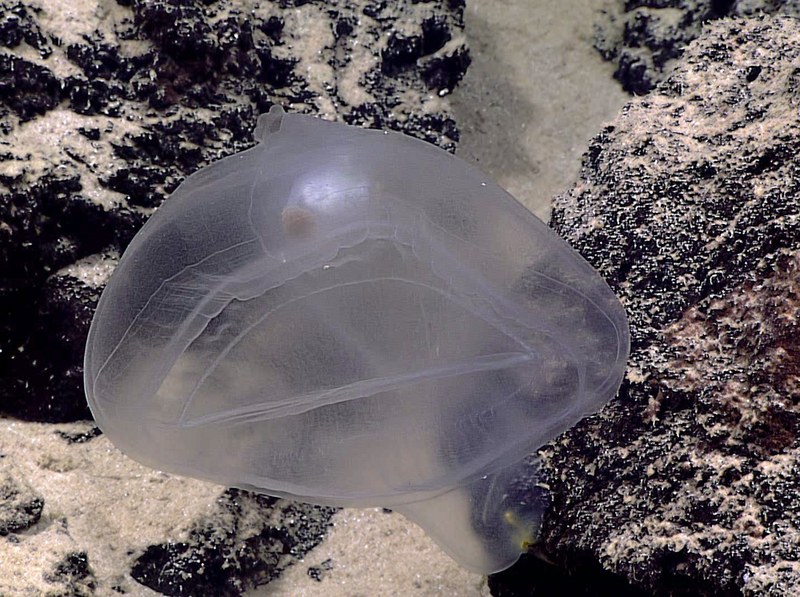 These deep-sea fish use a lure to attract prey and ambush them, swallowing them whole. The lure on this one is the round white structure resting between its eyes. 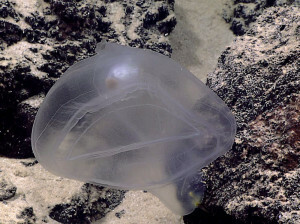 Here’s a seapig from the depths of the Marianas. 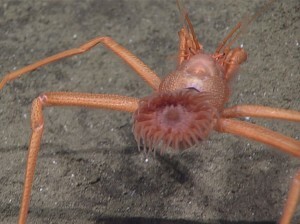 Its called the seapig because it is plump, pink and possesses short limbs. 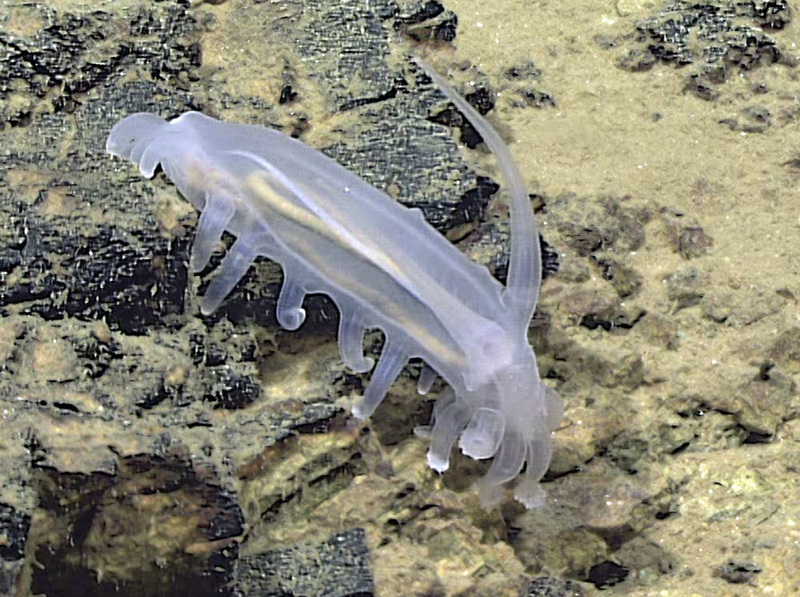 These animals feast on particles plucked from the mud they munch on. 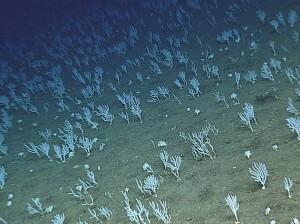 Researchers are not sure which genus it falls into. A little bird brought me exciting news this morning. As i am writing this, an expedition in the Marianas Trench is in the middle of its 69-day expedition into the deepest part of the worlds oceans. 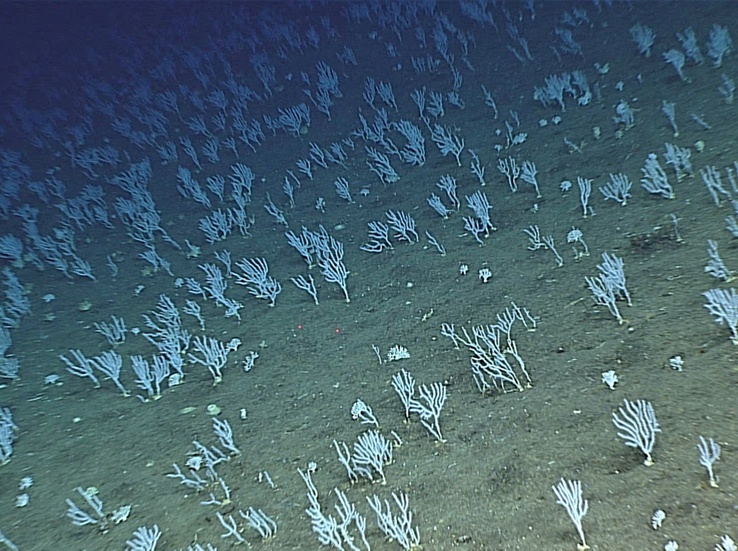 Led by the National Oceanic and Atmospheric Administration (NOAA) and its partners, this expedition is starting the second leg of its 3- leg mission aboard the NOAA ship Okeanos Explorer to collect critical baseline information of unknown and poorly known areas in and around the Marianas Trench Marine National Monument (MTMNM) and the Commonwealth of the Northern Mariana Islands (CNMI). The tentative schedule for the full expedition can be found here. This expedition will bring light to extreme habitats, sponge communities, mud volcanoes, hydrothermal vents and some strange creatures some of which will be posted here throughout the rest of the expedition. As most of us welcome the new year with much enthusiasm and ambition, many young Papua New Guineans and their families greet the dawn of a new year with stress and anxiety for this also marks what is probably the most important part in their lives. In the Papua New Guinea (PNG) education system, High School Certificate (HSC) exams come at the end of year 12 and always seem to signal the ending of a calendar year. Year 12 students all over the country sit for this exam and the results are graded and used to select who continues on to tertiary studies. For some, sitting for the HSC exams would be as far as they go in their formal education while for others, getting an offer after the HSC is welcoming news with the promise of a good life after tertiary studies. A little over a decade and a half ago, the education system in PNG was a lot different to what it is today. High schools existed through which one only passes through to years 11 and 12 after the national exams at the end of year 10. There were only 4 National High Schools around the country (Passam, Kerevat, Sogeri and Aiyura) then and competition was fierce for placings in any one of these schools. Then came the education reforms which converted high schools into secondary schools offering years 9 through 12 at the secondary level. Year 10 and 12 exams were still in place but there are talks now of doing away with the year 10 exams paving the way for a smooth transition straight to year 12 and the HSC exams, meaning a lot more young people would continue on to year 12 creating a bottle neck at after the HSC exams. This post looks at the results of the 2015 HSC exams based on acceptance into ONLY the six major universities in PNG and an observation of the performance of the many secondary and National high schools in PNG today. The analysis discussed here focus only on the number of students selected to enter the six main universities in PNG, namely; Divine Word University (DWU), Pacific Adventist University (PAU), University of Goroka (UoG), University of Natural Resource and Environment (UNRE), University of Papua New Guinea (UPNG) and the Papua New Guinea University of Technology (UniTech). Acceptance lists used in this analysis were downloaded from UniTech, UPNG and DWU websites while listings for UNRE, PAU and UoG were taken from the Post Courier (January 8, 2016). 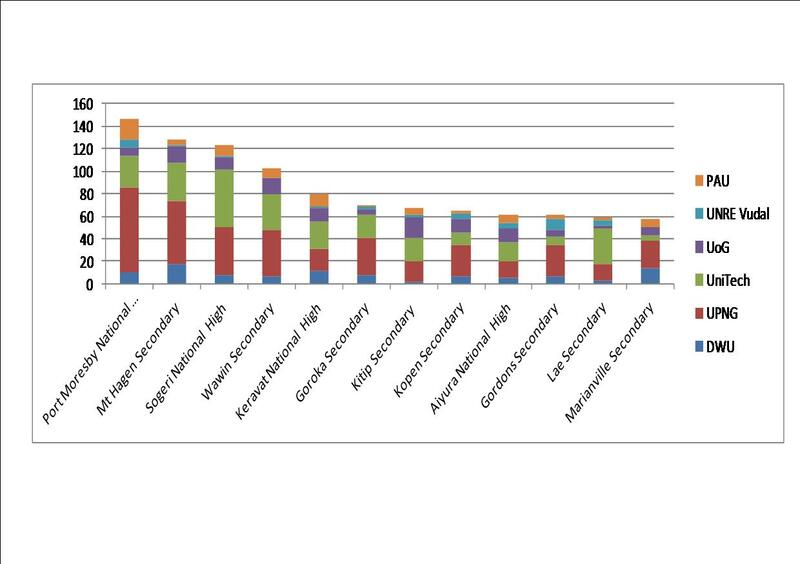 Only school leavers (those continuing on from year 12) were considered in this analysis including those accepted for studies in open colleges. PDF copies were downloaded and converted to excel spreadsheets for analysis, while lists in the news papers were done manually. The top 12 schools (per number of students selected to the main universities) stand as: Port Moresby National High School (146), Mt Hagen Secondary (128), Sogeri National High(123), Wawin National High (103), Kerevat National High(80), Goroka Secondary (69), Kitip Secondary (67), Kopen Secondary (65), Aiyura National High (61), Gordon Secondary (61), Lae Secondary (59) and Marianville Girls Secondary (58). 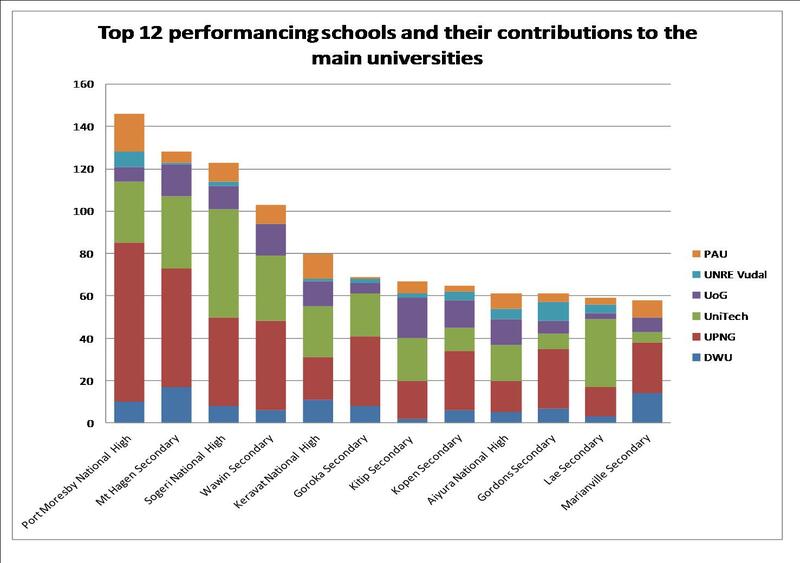 Below is a graph of the top 12 schools and the number of students from each school selected to each of the 6 main universities. Population growth in the last 2 to 3 decades is a likely explanation for the sudden increase in the number of secondary and schools and national high schools. There is also the free education policy granting more Papua New Guineans access to education in a bid to increase literacy rates in PNG. With 139 different secondary and National High Schools in PNG, the government has done well in making sure everyone has access to education but how good is the education when only the top 12 schools provide up for 40% of the students continuing on to tertiary studies at Universities? what happens to the all the other students who have missed out on placings in tertiary studies? Is education to year 12 the only way to increase literacy rates? PNG’s literacy rates are a concern but having a bottle neck at the end of year 12 may not be the solution to this. While education is a solution to the literacy problems, having so many secondary and national high schools and a bottle neck at the end of year 12 is an injustice to the students and parents. Having fewer secondary and national high schools would not cause available resources to be spread so much. An example is that if there were 5 very good teachers (each teaches a different subject) in an area, having 5 schools in that area increases the likelihood of there being one teacher per school. If there were only 2 schools, then each school would have up to twice the number of good teachers it could have if there were more schools so the students are taught well in two subjects instead of one if there were 5 schools. Fewer schools mean government funding is more focused and fewer schools encourage competition between the students, teachers and schools. One suggestion is that, the number of secondary schools today must be reduced by at least 50%. There should be at least two secondary schools per province as well as the regional national high schools. Year 10 exams should be reinstated, the number of high schools (years 7 to 10) be increased and a year ten exams used as a bench mark to select the best students to got into secondary/national high school. This allows for the literacy problem to be addressed, creates an environment where only the most eligible make it to year 12 for the HSCs, encourages a system where resources are not wasted unnecessarily and finally, results show more competition between schools to produce students for further studies. I travel a lot for business, but of all the places I’ve been to, I must admit the New Guinea Islands (NGI) hold a soft spot for me. Tropical sunshine, warm crystal clear waters, superb fishing, lush tropical vegetation, white sandy beaches, azure blue waters, great surfing and the friendliest people are just some of the reasons why a visit to Papua New Guinea’s NGI region is a must for any bucket list. There is also so much history in the region, relics of the two world wars and what I just discovered – amazing tales of the effects of the volcanoes on the locals living around them. In this post, I write about my most recent visit to Rabaul where i had the opportunity to visit a world war two Japanese tunnel. Rabaul was a Japanese stronghold during the Second World War and provided an excellent launch base for the Japanese to capture Port Moresby in their quest to invade Australia. 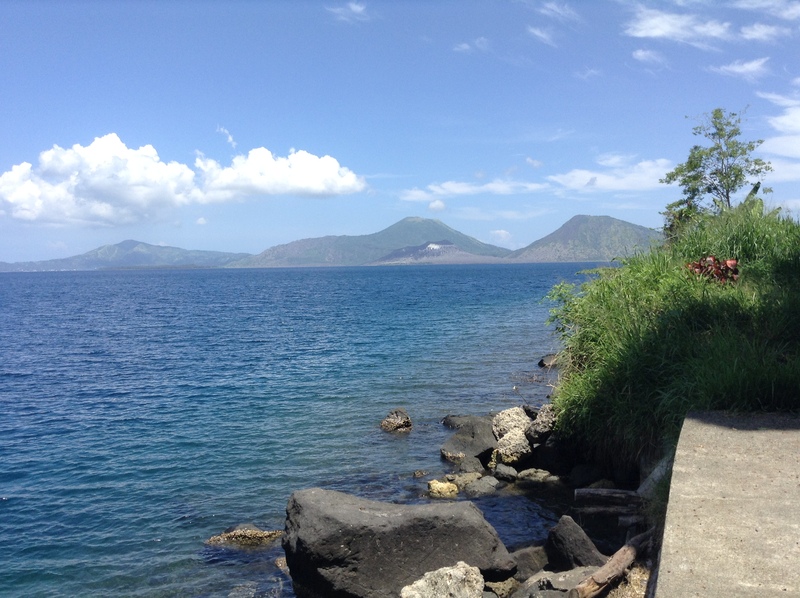 Rabaul itself sits on the rim of an extinct volcano, much of what was once the caldera now lies under the waters of the Simpsons harbor. This geological feature provides a unique bathymetry of the harbor where the seafloor drops from a few centimeters to depths of 80 m or more in less than 3 m from shore, providing an excellent cover for submarines ferrying cargo to the soldiers on the ground. 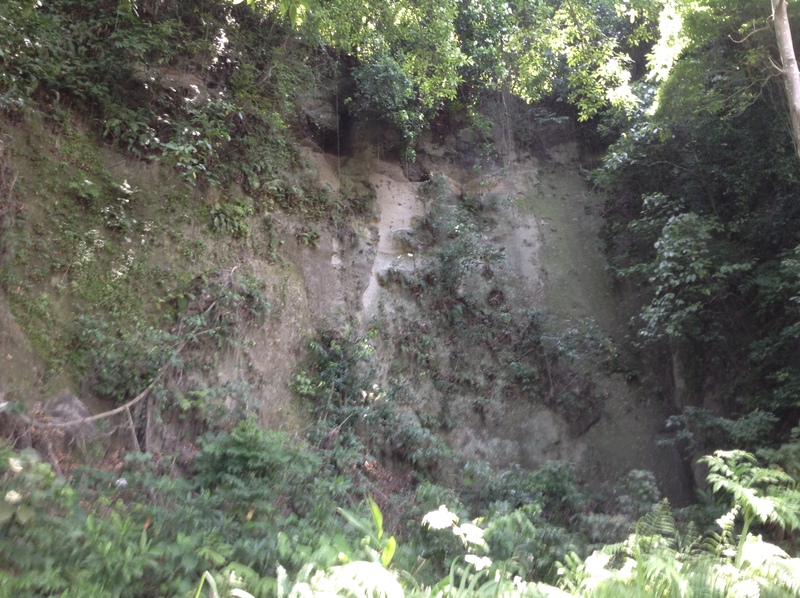 The earth around Rabaul is almost entirely volcanic ash deposited from numeric volcanic events in the area going back to probably the birth of the New Britain Island itself, so naturally, digging a tunnel here was relatively easy. These tunnels have three common features, an opening for storing cargo unloaded from the submarines (sometimes these also serve as parking areas for submarines that needed to be taken out of the water), next is a linking passage usually at the end of the tunnel linking other chambers and my finally my personal favorite, a gun-hold above the tunnel entrance that serves as a lookout. In most instances, these tunnels were built on the bases of steep slopes only accessible from the sea which gave the gunner leverage over anyone/thing approaching from the sea. 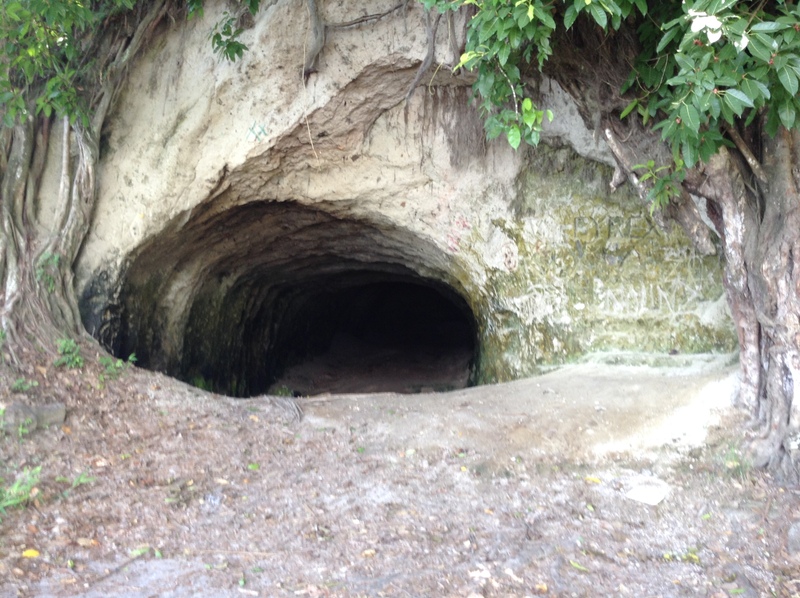 I had the opportunity to stop by one of the tunnels on the side of the road between Rabaul and Kokopo. 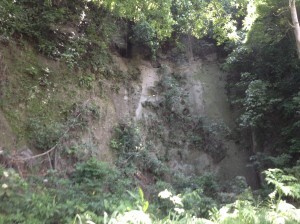 All the features were there; these days the Rabaul – Kokopo road runs across the entrance of the tunnel. Across the road is the ‘Blue Lagoon’ where the depth drops steeply into the abyss in less than a meter from shore. Looking back, the gunhole isstill visible more than half a century after the last world war. Standing here, its quite amazing to think that about 60 years ago, I would have possibly been standing in front of a human chain ferrying cargo from a Japanese submarine. Inside this tunnel is a lot different from what it used to be, remnants of a recent drinking fest and old fire places scattered all over the place are testaments of what this tunnel is used for these days. Its sad though because this is an important piece of PNG’s history might be lost if not properly taken care of.